Last week CJ talked about the the switch from squares to hexes and the financial aspects of trying to bring a game to market. This week I'd like to talk about the personal and psychological aspects. The first thing I think of now when I reflect on how Battle Tank has progressed is playtesting. There has been a lot of it over the course of two vastly different prototypes, and it has revealed things that math alone never did. For one, we have changed almost every one of the original rules due to how it felt at the table. Gameplay trumps theory for me, so if it seems like it would be fun but turns out to slow things down without noticeably increasing enjoyment, then it has to go. As an example, in the original versions we had cliffs and ravines and needed to devote nearly as much space to how line-of-sight, movement and range worked in those instances as we did to the rest of the movement and shooting rules combined. Elevation is a complicated thing in play when you really think about it. So in the interest of speedier play and fewer arguments we now only have two elevation levels: ground level and higher level. And the rules are simple: if your line of fire crosses a cliff hexside then the attack must either originate or terminate in that hex. That is you have to be looking over the cliff or your target has to be doing so. Unless the shooter or the target are flying, in which case you always ignore all intervening terrain. Cliffs used to be impassable as well as difficult to shoot near, but now they are only impassable going up and you are free to drive (if you are a tank) or walk (if you are a robot) over them at the cost of suffering an automatic malfunction roll. Naturally, flying robots aren't concerned with cliffs and Megamech is capable of climbing up and down cliffs with terrifying swiftness so it also ignores them when moving on its turn, but the big 'bot is still susceptible to being rammed by a tank and pushed over the edge just like any other walking robot. Perhaps the only thing that hasn't changed is how you shoot at your opponents. Since the beginning, you simply roll a single die and compare it to the range, terrain and armor of the target. Equal or exceed that derived number results in a "hit" and the target rolls on its malfunction table. Tanks have high armor and a forgiving table since they are a player's only unit. 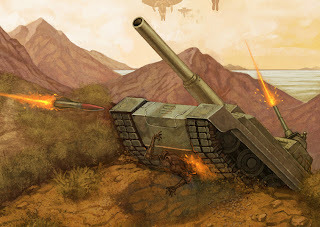 Robots on the other hand have low armor and typically explode when hit but the come in large, ever-increasing numbers. At this point we aren't testing the rules themselves anymore*, but instead changing the board and the tokens to make the rules easier in play. For instance the central hex of each tile is marked because it is referenced in several rules and we've found it can slow down play if you have to stop and be sure which hex it is every time it is needed. *Naturally there is an exception to this, and it's Mad Scientist Event cards. The MSEs are large, potentially game changing things that occur randomly. How randomly has been a significant issue.